My name is Anthony Purches, my parents were keen collectors of antiques and I have had a lifelong interest in antiques, visiting many fascinating antique shops and fairs as a child and have bought, sold and collected antiques and collectors items since my youth. I acquire items from every possible source ranging from jumble sales, house clearances, antique shops, auctions and several museums that were closing down. I have sold items to collectors, museums, theatres and television companies. I have traded from shops in Worthing, Brighton and Arundel. 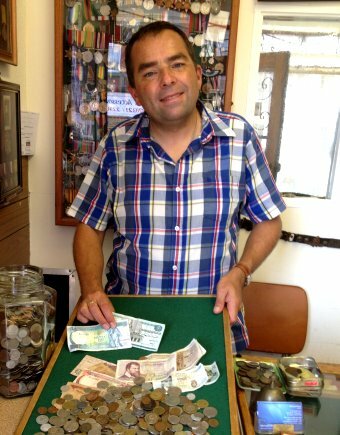 In 2007 I was pleased to succeed in purchasing the long established Sussex Coin Company, well known in Worthing since 1968. As my interests extend to a wide range of antiques, vintage and collectors items perhaps I should have changed the business name to Anything Old, but I would not want to change a business that I first admired as a child. I remain a keen collector of military items myself and always keen to purchase interesting items for my collection. I am as enthusiastic today as i was when I took my first steps in the world of antiques over thirty years ago. I love and admire old things, not only rare and valuable objects but also items that reflect a sense of past history.